Attacker Katie Giordano plows through the defense for a goal against Oak Knoll during Tuesday’s 14-4 loss. 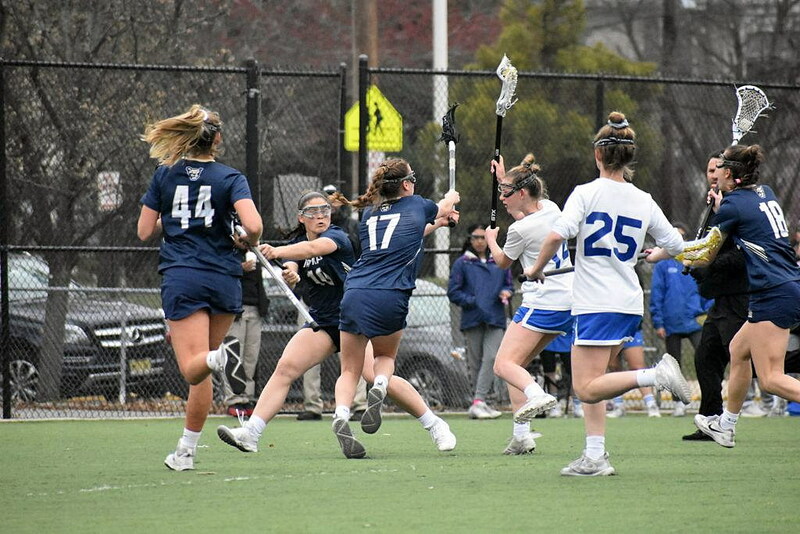 It’s been a rough start for the Montclair High school girl’s lacrosse team, and it didn’t get any easier Tuesday, April 9, when they took on a tough Oak Knoll team. While the Mounties (1-4) played hard and never gave up, the Royals (4-1) were too talented to be denied and beat the home team 14-4. “Overall, I thought we fought the whole game, and the score didn’t really reflect that, but Oak Knoll really had to work for all those goals,” head coach Ann Jennings said after the game. Mistakes were the story of the game,really, as the Mounties turned the ball over at midfield too often. It took awhile for the defense to get going, but once they did, the Mounties defenders were able to move the ball upfield, but once they crossed midfield, all too often MHS coughed the ball up and Oak Knoll took it the other way. There were a few bright spots for the Mounties despite the loss. First of all, goaltender Jada Auletta had a tremendous game. While she did allow 14 goals, and consistently made amazing saves, especially in the first half. Montclair only trailed 5-3 at halftime, but if Auletta hadn’t stood on her head for most of the half, it could have easily been a score of 12-3. 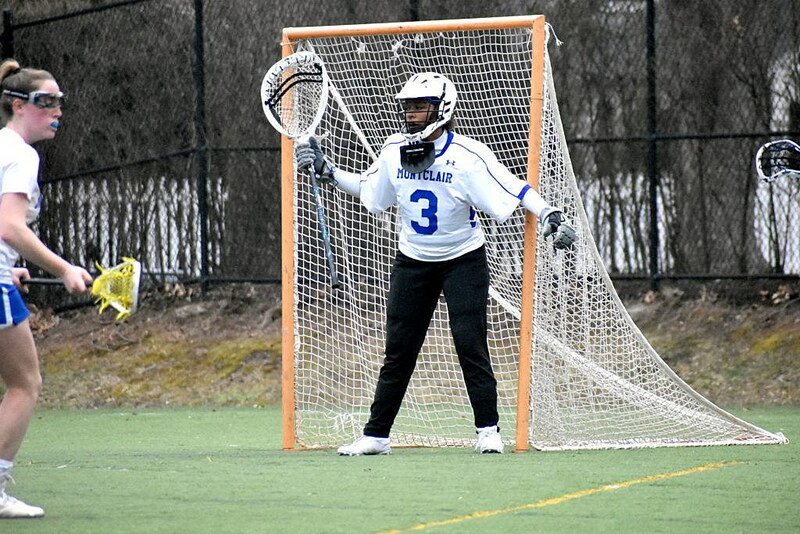 Goaltender Jada Auletta faced a barrage of shots, and managed to make some spectacular saves during Montclair’s loss to Oak Knoll. Auletta has filled the shoes of former goaltender Olivia Lynch, and proven herself to be a tenacious netminder, with a knack for communicating clearly what she needs the defense to do. That’s made it easier for the Mounties, knowing they have a reliable goalie in net. Defensively, the Mounties took a little while to get going in the first half, falling behind 5-0 by the 13:23 mark of the period. That last 13 minutes saw a very tough MHS defense though, and that, in turn, helped the team generate offense and close the gap. Abby Romano scored once with just 25.1 seconds left in the half, before Katie Giordano made it 5-3 with just 13 seconds left. Auletta had one more big save at the buzzer and the Mounties entered the half trailing, 5-3, but with momentum. The Mounties still had momentum in the second half, and spent a lot of the first five minutes in the Oak Knoll end, though they failed to score. Unfortunately, Oak Knoll found their rhythm again and piled up nine points, while only Nanette Walls-Tarver scored for the Mounties. Montclair has a game on the road against Westfield Thursday afternoon, April 11, before taking on crosstown rival Montclair Kimberley Academy at home on Friday April 12, at 4 p.m.